Crepes are good for lots of reasons. You can eat them with your hands. You can put almost anything on them. Children can eat them like wild savages and ask for Nutella on top because "that is an official crepe topping and not an actual chocolate treat". The crepes at Four Frogs Creperie are very good. Opened in 2013 by four French men who came together in a united front for excellent crepes, the small cafe has 44 varieties of crepes and galettes, and that's not including the daily specials. The four French men (aka the "Four Frogs") felt the traditional thin French pancake was not well-represented in Australia. Their frustration inspired Four Frogs, owned by founding chef Florian Guillemard, a native of crepe country, Guerande, Brittany. The aesthetics improve on closer inspection. 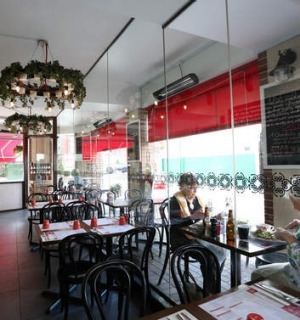 Jaunty bright red awnings shade outdoor tables. Elegant dark bentwood chairs and stools rest at tables set with paper menu placemats and red melamine water tumblers. Inside, against sparkling, white-tiled surrounds, staff zip about in natty caps and monogrammed black aprons. There are French accents aplenty along with men in rolled-up shirt-sleeves expertly ladling batter onto the special round, flat crepe-makers, then piling on ham, eggs, strawberries, cheese, chorizo, mushrooms - though not all at once. Crepes and galettes - crepe made with buckwheat flour - are a specialty of Brittany. Crepes are from Basse-Bretagne (Lower Brittany) and galettes from Haute-Bretagne (Upper Brittany). The menu is divided between galettes (savoury) and crepes (dessert). 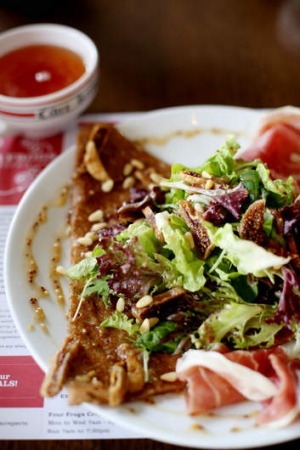 Galette ingredients include ham and Swiss cheese, smoked salmon, sun-dried tomatoes, walnuts and salad. 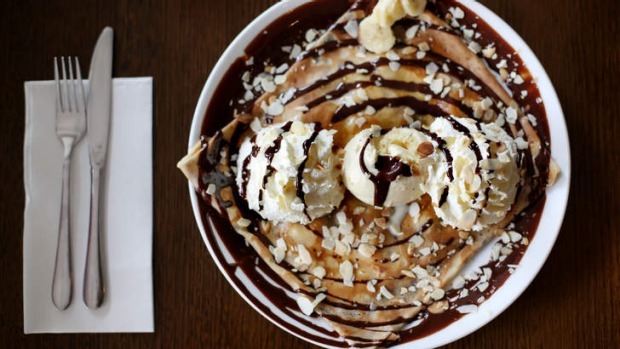 Crepes come as simply with butter and sugar, or Nutella, or in versions featuring white chocolate ice-cream, bananas, whipped cream, salted caramel sauce and grilled almonds. We select three galettes - dry fig, goats cheese and pine nuts; ham, egg, Swiss cheese and mushroom; and smoked duck, spring onion, Swiss cheese and Hoisin sauce. The small girl at the table chooses the ham and Swiss cheese galette from the children's menu, which also doubles as a colouring-in page with pictures of four frogs (pencils provided). The galettes are beautifully soft and crispy, with the ham and cheese a melty, smoky delight. Just as good are the fig and duck versions, the figs sweet against the bite of the goats cheese and the duck meat tender and moist, matched perfectly with the dark Hoisin sauce and crunchy spring onions. Each looks like a four-sided envelope package that reveals its well-packed contents from the centre. They are filling but not heavy. A glass of French cider, traditional with crepes, is icy and cleansing, as is a Kir cocktail - white wine and blackcurrant liquor. The small girl slurps down a vanilla milkshake before munching more galette and colouring one of the frogs pink. Next is dessert, which feels excessive until our slender and pillowy range of crepes arrive. The butter and sugar version is divine, moist and sweet without being over the top. 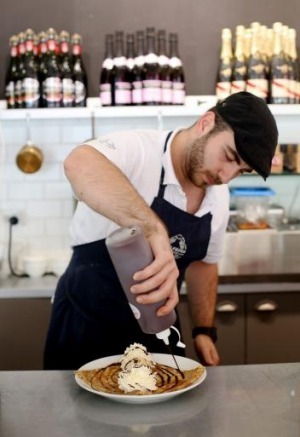 What threatens to be over the top - the coconut ice-cream and homemade dark Belgian chocolate sauce crepe - manages to be rich, creamy and fragrant without being cloying. The small girl's Nutella crepe is gone in seconds, helped by everyone begging her for a taste. To accompany we whip down rich and strong flat whites and a long black, made from Four Frogs' own blend created with local micro-roaster Bay Coffee. The service throughout has been attentive and personal, with our French-accented waiter clearly proud of, and enthusiastic about, this modest yet enticing crepe house. We all leave with Nutella moustaches, full stomachs and enjoyably bad French accents.